Wedding Card Maker Software easily creates invitation cards in various colors, shapes and sizes according to your requirements. Wedding card making program provides advanced designing tools including Rectangle, Ellipse, Line, ClipArts, Watermark, WordArt and other objects to create attractive wedding cards. Wedding card design program provides inbuilt templates to create customized invitation cards. 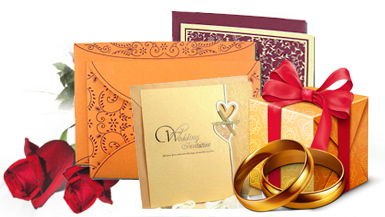 Wedding card making program easily designs bulk numbers of invitation cards using batch processing feature. Wedding card making program allows you to add background, style, shapes, images and other objects on card. Here, You can see your designed Wedding Card using 'DRPU Wedding Card Maker Software'. Create attractive wedding cards : Wedding card maker program easily designs invitation cards in different shapes including rectangle, ellipse, rounded rectangle and CD/DVD shape. Inbuilt advanced email settings : Wedding card maker program is integrated with inbuilt email settings to send created wedding card at user specified email address. Creates invitation card using templates : Wedding card designing program provides wide-variety of predefined templates to design customized invitation cards. 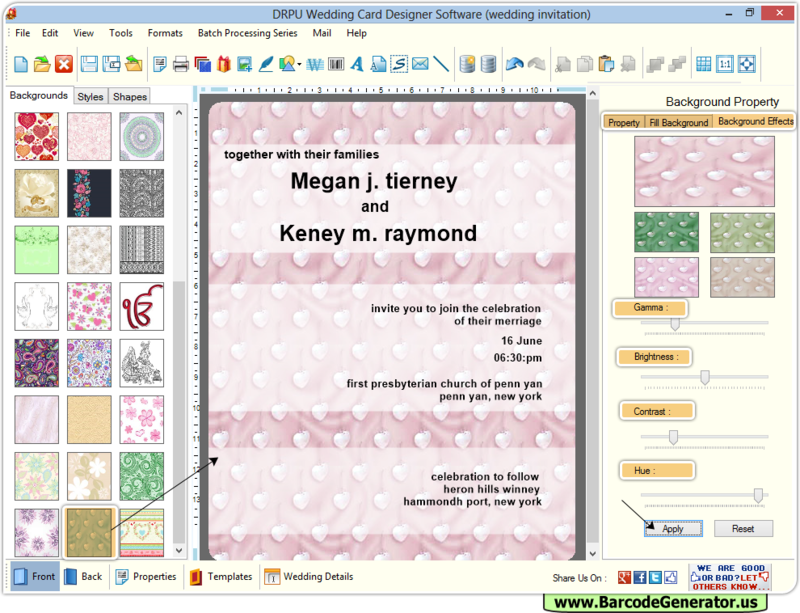 Inbuilt printing settings : Wedding card design software provides flexible printing settings to print designed invitation cards. Design invitation card using designing tools : Wedding card making program makes designer wedding invitation cards by the help of inbuilt designing tools like ClipArts, Signature, WordArt, Barcode etc. Instantly designs bulk numbers of invitation cards : Wedding card program easily creates multiple numbers of wedding invitation cards using batch processing series option. How to generate Barcode labels ? How to generate 2d Barcode ?